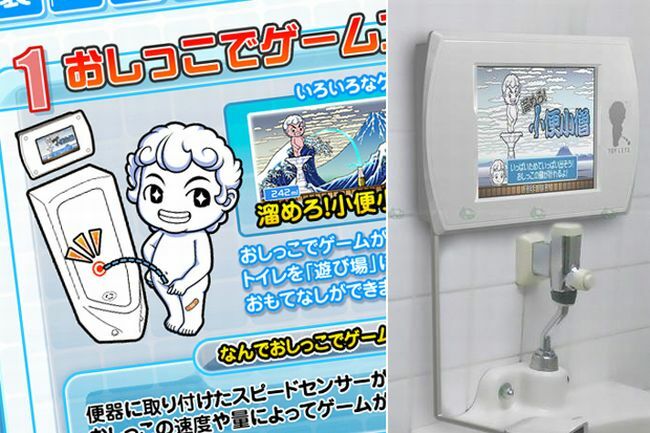 First comes news of tricked out San Francisco bus stops, now its Tokyo urinals that are getting the game treatment. It seems free digital diversion in public places is the norm for 2011. Sega actually installed the Toylet series of games so that guys can pee straight. That’s right, pee straight. Since men are messy pee-ers in general, why not use simple games to induce them to “shoot straight”? The games were installed in lavatories in four bars and a gaming arcade. They include Splashing Battle, Manneken Pis, and North Wind and Sun. Then there’s the lovely first person shooter where the gamer uses their pee stream to ‘wash’ graffiti off the computerized target wall. The other three games are just as clever. Splashing Battle compels those peeing to raise their pee stream and break the record of the lavatory’s previous user. North Wind and Sun is rather naughty, as the intensity of one’s pee stream controls a gust of wind that’s blowing up a woman’s skirt. Manneken Pis is the most straightforward though and reduces the competition to measuring someone’s pee volume. As fun as these diversions are, Sega’s initiative is a shortlived gimmick that will only last till month’s end. The Japanese ability to entertain themselves with almost anything amazes us all.